Running is a sport that attracts all sorts of people, from the ones who are athletically built to the more average ones who are trying to maintain a healthy lifestyle. People run for many different reasons, but no matter what kind of runner you are, wearing the right shoe is very important. This will ensure that you minimize injuries and enjoy running for a very long time. Heavier runners will need to look into more factors when they shop for running shoes, though. Because of the heavier weight that they need to carry with every step, they will need a shoe that has extra support and added shock absorption. Choosing the appropriate shoe for heavy female runners may also need other considerations because their anatomy makes their biomechanics different from males. Your joints will absorb an average force of 1.5 to 3 times your body weight with every running step that you take. This is why practicing good running form and purchasing the right pair of running shoes is vital, especially for overweight female runners. New Balance started out as a company that manufactures arch supports and orthopedic shoes. With over 100 years of experience in the field of making shoes, they are continually perfecting their craft and have since made a big name in the field of running. They have all sorts of running shoes for every athlete and every goal, and for the heavy female runner, the New Balance Women’s W940v3 is perfect for the job. It is a wide, roomy shoe with lots of cushioning that is highly recommended for those who overpronate. This model is New Balance’s ultimate stability shoe, equipped with the ABZORB technology that increases the shoe’s compression resistance and cushioning. This is greatly helpful in absorbing the impacts of heavy strides. It also has a T-BEAM which is a light, flexible TPU shank that provides enhanced stability and arch support. ASICS is another company that has been around for quite some time now. It started as Onitsuka Co. Ltd. in 1949 and was rebranded as ASICS in 1977 to promote health and fitness. Today, ASICS is widely known in the running world as a reliable running partner that delivers a comfortable bounce in every step. For overweight women, the ASICS Women’s GEL-Nimbus 17 provides a supportive and cushioned ride. It has a seamless FluidfFit upper that helps prevent blisters to allow for long and serious training. Its Guidance Trustic System and ComforDry X-40 Sockliner technologies are made to assist people with various running gaits, from underpronators to those who have a more neutral stride. This doesn’t only make the shoe very comfortable to wear, but it also makes the wearer’s running more efficient. Brooks, just like New Balance, also has over 100 years of experience in the field of creating running shoes. As a company that draws data from thousands of runners’ insights, they are constantly making product innovations that aim to advance the feel, fit, performance, and style of their latest running gears. 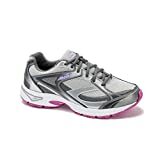 Now, the Brooks Women’s Addiction Walker is not exactly a full-on running shoe, but it may be taken for light runs if you wish. However, this model is more appropriate for the person who wants the feel and fit of a running shoe in their casual, everyday footwear. It will make long walks and extended periods of standing comfortable, making it great for overweight people as well as for those who are suffering from shin splints and plantar fasciitis. Its HydroFlow® technology boosts the shoe’s midsole as well as its shock absorption properties so it is very loaded with support for overpronation and low arches. The above choices are also the best running shoes for heavy runners with wide feet as all of these models come with a wide option. The first step in finding the right shoe for overweight runners is to find a local running specialty store with trained and experienced staff, preferably people who have running experience. Tell them that you prefer a model that can make it easy for heavy runners to walk or run around. For the staff to determine which among their shoe models are the most appropriate for your preference, have them perform a gait analysis on you. They will ask you to remove your shoes to get a closer look at your feet. They will study your foot type and your gait, and this will allow them to know whether you need a neutral shoe, a stability shoe, or a motion-control shoe. Once the salesperson retrieves various shoe models based on his or her assessment of your foot, it’s time to try them out. Wear every pair and take them on a run on the store’s treadmill or walk around the store in them. Compare all the models and prioritize which ones feel natural and are absorbing the shocks well. Though it may be tempting to choose the model that looks aesthetically pleasing, what you should ultimately choose is the one that feels the most supportive. It is better to be able to move with no injuries than to run in great-looking shoes but have painful feet. The best running shoes for bigger runners are the ones that feel very stable and comfortable. Your shoe should be able to get you around with ease and make running an activity that you can enjoy for life.